With Faction Changes live surprisingly early, this Shared Topic happened to be timed just about perfectly. This topic was suggested some time ago by Nigiri of Adventures of a Priest. After publicly stating a while ago that they would not do this, Bliz has announced in their forums they are working on Faction change mechanic for players who want to switch. Here is a link to the European WoW forums with some Q&A by a Blue. This topic is a mine field. People who are against it seem to be very against it and people who are for it seem, for the most part, quiet on the subject. It would be interesting to read something longer than a short forum post with some well thought out discussion. Would you consider changing factions? What would it mean to you to do so? 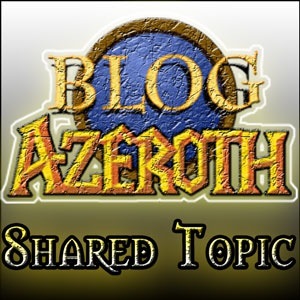 If you have any ideas on this week’s Shared Topic, or have one to suggest of your own, make sure you head on over to the Blog Azeroth Forums!